Maternity suits allow businesswomen to put their best foot forward during pregnancy; however, career apparel designed for pregnant women may be difficult to find. The good news is that there are specialty stores catering to pregnant working moms. What makes great professional maternity clothes? This depends somewhat on your body type and sense of personal style. 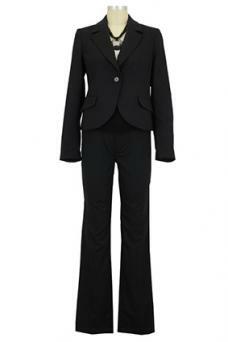 However, a basic black suit is a good choice for most women. If you find a suit that fits well, you can change the outfit's appearance by wearing different tops and accessories. Motherhood Maternity is known for offering maternity clothing at affordable price points, and they feature a simple line of maternity business wear separates. You can create a personalized suit with their separates, which gives you the freedom of mixing and matching tops and bottoms to fit your body type and size range. Their patent pending Secret Fit Belly® styles are available in pencil skirts or slacks and can be paired with the coordinating blazer to create a sharp, professional looking suit. Sizes go from S to XL and prices start around $15 to $50. These separates come in black or caramel. Shop online or at a store location near you. Motherhood Maternity has a 30-day return & exchange policy. Items can be returned to a store or by mail. Cascade Bi-Stretch Suiting Maternity Jacket: This classy jacket retails for under $45 and features a stretchy material for comfort and ease, long sleeves, and an open cascade-style front, which creates a slimming profile. Wear it with slacks or skirts to create a work-ready suit or use it as a layering piece with dresses or tops. Choose from sizes S, M and L.
Secret Fit Belly®Pencil Fit Maternity Skirt: You'll love the comfy fit of this flattering pencil skirt with its seamless stretch panel, which is perfect for accommodating your body during all the pregnancy trimesters. It features a bi-stretch material that gives rather than constricts, a back slit for freedom of movement, and a flattering skirt style. Priced under $30, it's available in black in sizes XS and XL. Customer reviews are highly positive about how perfect this skirt is for work. A Pea in the Pod is the go-to store for the fashion-forward expectant mom who wants business clothes with a contemporary look. Their maternity career apparel consists of maternity skirts, slacks and jackets that can be mixed and matched with ease to create dozens of professional suit ensembles. Sizes range from XS to XL. Prices start around $40 and go to about $400. A Pea in the Pod's upscale maternity fashions are a favorite with celebrities like Emily Blunt and Stacy Keibler. While you may not work as a high fashion model or Hollywood star, you'll look and feel like one when you wear their maternity career wear. Shop online for convenience or visit one of their store locations to try on their fashions. Purchase over $150 and your order ships for free. A Pea in the Pod has a 45 day return and exchange policy. Ella Moss Open Front Rayon Maternity Jacket: Classic elegance meets trendy in this on-trend plaid jacket. It features an unstructured style, open front and cropped back, and long sleeves in sizes M and L. For under $120, this wardrobe extender mixes and matches with skirts and slacks to create multiple suiting looks for work. As a plus, the open front creates a vertical line that is flattering and slimming. Secret Fit Belly® Bi-Stretch Suiting Wide Leg Maternity Pants: Wide leg pants are making a comeback and these comfy pants with the front stretch panel are just what the doctor ordered for a long day at the office. Pair them with the open front jacket above or with any of the other jackets in A Pea in the Pod's career wear line for a fashionable maternity suit that will turn heads. Retails for under $50 and is available in black in XS. Figure 8 Maternity is an online-only vendor catering to expectant moms with a sizeable inventory of maternity suits and career wear. Besides being stylish and comfortable, these versatile elements mix and match so you'll never feel like you are constantly wearing the same outfit. Choose from maternity pant or business suits or coordinated separates in sizes S to XL. Price points range around $60 to $225. Customers who purchased maternity business wear from Figure 8 raved about their satisfaction with the product's fit and value and their delight with the fast delivery. Figure 8 Maternity offers free shipping with no minimum order requirement. They have a 30-day return policy; customers pay the shipping costs to return items. Join their Loyalty Program to earn Loyalty Dollars to use on your next purchase or gift them to a friend or relative who is also expecting. Audrey 3/4 Sleeve Front Tie Jacket, Skirt & Slim Pant - 3-pc. Suit Set: You'll look stylish but feel completely at ease in this three-piece suit from Maternal America. It features an unstructured front wrap jacket to conceal your baby bump, comfortable pull-on straight leg pants, and a sleek, slimming pencil skirt with a flirty front pleat to show just enough leg. Charcoal goes with almost anything and it can be dressed up or down to suit the occasion. Choose from sizes XS and S for around $220. Kimberly Classic 2-pc Maternity Pant Suit: The clean, crisp silhouette of this classic black wool suit from Debbi O makes you look long and lean even when you don't feel that way. It features a fitted, one-button jacket that falls to just above the natural waist and straight leg pants with a stretchy front panel. It comes in sizes S to XL and retails for under $200. If you decide a business suit is a wise investment for your maternity wardrobe, don't rush out to buy a new suit as soon as you realize you are pregnant. Most women won't start showing until they are about three to five months pregnant, and some women are well into their third trimester before they even need maternity clothes. It's hard to predict how your body will change during pregnancy, so it's best to wait until you have a noticeable baby bump before you start shopping for a new wardrobe. During your first few months of pregnancy, you may be able to wear an ordinary suit one or two sizes larger than normal. If the suit has a long line jacket, wear it open to help camouflage your growing belly. If the pants seem tight, try using a Bella Band for extra breathing room. Wearing a business suit helps you to look your best throughout your pregnancy. Add well-groomed hair, carefully applied makeup, and tasteful accessories to allow you to project the image of a confident, successful businesswoman, even on days when you're feeling nauseous, exhausted, and overwhelmed by the changes in your body.